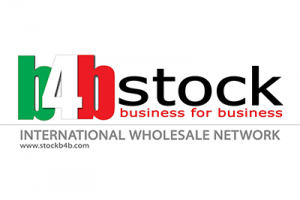 Stock B4B, a Italian and international development and investment company, with synergic business diversifications (wholesale, media bartering, big stores, outlet, temporary sales activity, events, e-commerce, licencing). We boast many years experience in sales. We are part of a group of companies that are active in different synergic businesses, a worldwide network. Our vision is to offer our customers the best products to go beyond their expectations. We offer the best quality at the most convenient price. We are thankful to our customers and partner that gave us the possibility to grow and improve our services. We are ready for the next level: continue the improvement of the service for our customers and keep their satisfaction level very high.